These happenings concern rosary promise #3. Part of the message is that the rosary shall defeat heresies. Two or three days in a short period of time, I would dream and picture a specific animal. In the morning, immediately after having the vision, I would go out and get the morning paper from the box, and start to read it. The vary first thing my eyes would see would be the animal in my dream. A short time after these occurrences, I was awakened by a somewhat high pitched, male, Almighty voice. The exact words I heard were "I have a telescope." This effectively defeated my heretical belief that God did not see every little detail of every little thing, but that our guardian angle would see everything and keep track. Not long after this, I was in church during the renewal of our baptismal vows, and the priest spoke with the same Almighty voice. This defeated my heretical belief that God did not speak directly through the mouths of His representatives - His priests. Before I joined the Catholic Church (about a year ago) I had a daughter from a relationship that I was in for ten years. She is now four. I have recieved many signal graces from praying the Rosary and here is a great one that just happened. I recently fought for full custody of my daughter who is four years old. The system in Minnesota is heavily slanted towards the mother and usually favors them. I have been in a situation where I have had my daughter the majority of the time for the last couple of years. I recently got married and the mother was threatening to take my daughter away to live with her when she moved into her new house. This was a very real threat as by law (since we were never married) she had full custody of our daughter and could take her at any time and I could do nothing about it. So I went to court and asked for full custody not thinking that I would actually be given it, I figured it would be a joint agreement. After court in December '08 I prayed a novena to Mary asking to be granted the custody I asked for in court. On Jan 21, 2009 I got a phone call from my attorney saying that the judge had made a ruling and I was granted full custody of my daughter. Hail Mary!! I can now raise her confidently in the Catholic faith (which her mother has objected to) and continue to teach her love and devotion to Jesus through Mary. Thank you Holy Mother, and thank you Lord Jesus Christ!! I could write a small book on the graces I have received through the recitation of the 15 decade rosary. I don't meditate on the mysteries, since these were added after St. Dominic was given the 15 promises, according to written history. Today's story happened shortly after I started praying the rosary, after a long absence. A friend of mine brought to my attention a particular flower. 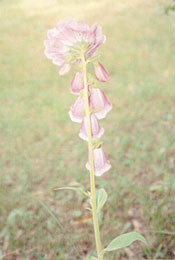 It was a digitalis . This particular digitalis had a flower on top that was as if someone had taken 3 or 4 of the normal digitalis and formed it into a new perfect new flower, altogether. I was captivated by this flower, and new it was something rarely if ever seen. I took 3 photos with a self developing polaroid camera, then I got my compact 35 mm. The polaroids actually are luminous at the new, top bloom. When I got my 35mm, I wanted the best possible pictures, and I don't use it often. I decided to find the manual for the camera, to use it properly. In the zipper pocket of the camera bag was a very old bookmark with the 15 promises of the rosary that my dad had given me, years ago. I had put it there for safe keeping, and long ago forgotten about it. I have had a very powerful signal grace and miracle connected with praying the rosary. Last year, I was praying the rosary, and asking for the protection of my family. The following day, my Father collapsed and died with a heart attack totally unexpectedly. He had absolutely no history of ill health. It became immediately apparent that his sudden death, totally fitted the meaning of my vision, "like a glove" as they say in England. The strange thing is, that I hadn't really prayed the rosary that much before this happened. (I pray it alot more now!) Neither am I a person who ever "seeks out" visions, as it is impossible to "seek out" genuine visions. I believe that by this signal grace, and miracle, the Blessed Virgin was preparing me for my Father's death, and foretelling that he was destined for Heaven. Strangely enough, I also had, totally without seeking them - and even more unexpectedly than the first signal grace - three more signal graces concerning my Father, in the weeks following his death. (Infact, I'm almost embarrassed by the generosity of the Blessed Virgin, in this, and am rather embarassed to tell anyone of the sheer NUMBER of the signal graces, that the Blessed Virgin sent me, without my merit). So I BEG everyone to pray the rosary. Heaven will be totally open to us if we pray the rosary. I am now praying the rosary for the other members of my family (and other people), that the Blessed Virgin will protect them also, when they die. When i had just lost faith in everything including the holy rosary, the Lord drove me right to this site. I do not know how i stumbled on this particular site. I have had some difficulties lately and it's as if the whole world is crumbled. I have been over anxious and have lost faith in everything. Then i thought about my good old rosary but then again i started doubting if it is real at all. I started reciting my beads and i heard this loud voice telling me "If you don't believe it then why do you bother calling her? She helps people who have faith". I thought it was my own imagination or it was probably my own thoughts. Then i read about signal graces and to my surprise, everything i thought of as a signal came to pass within the next 3hrs. The most significant one was asking for a sign that my husband will buy me ice cream since its been a long time he did that and to my surprise, he came right home with my favourite vanilla ice cream. i couldn't stop get over this ice cream and this made him ask why i was so crazy over the ice cream and i told him you dont know what this means to me. So at last, i have also experience signal graces. Hmm, we have a weapon. Do not let any thing take you away from the rosary. It happened to me and i lost my faith but now i have it back and i can't describe the joy i have now in spite of my difficulties. This is the same feeling i have been searching for all this while. after reciting rosary and praying for someone to get cured that person is such a hardheartned person but now believes in rosary now and recovering from the negative vibes.rosary is truly a powerful weapon against all the darkforces as i have experienced personally. In 1993, I was working as a Phlebotomist at Bryn Mawr Hospital. I wanted to go to nursing school, but I wanted to get into the Hospital sponsered program with a local community college because of the cost , the ease of getting into the program because of it being hospital sponsored( and they only sponsor 6 seats every year), and the length of the program. My husband and I had also just had our son Michael, we were young and broke. I had prayed my Rosary that I would get into the program for that year. ( Now this community college had waitng lists for people to get into their Nursing program because it was so popular and cheap that some people would have to wait a few years, and local hospitals would sponsor a certain aamount of seats for their employees each year) After the hospital made their decision they called to inform me that I did NOT get in, but that I would be on the next list. Well, I felt devastated, I cied and couldn't understand. But I didn't lose my faith. I still kept my trust in God. I figured whatever will be will be. Any way, shortly after, that I got a phone call from the Hospitals HR Dept, that one of the girls that was chosen wasn't able to begin that year, and if I would like to take her seat,of course I was elated and new that this was OUR MOTHER'S work. That odd thing was that when i started the Nursing program, the girl that wasn't able to take her sponsored seat and was given to me, attended the program anyway at the same time and graduated Nursing School with me.